A continuous stream of conversation and information exchange is integral to getting work done in any team or organization. Conversations between individuals or groups may be internal to the company (like employees) or external (like channel partners, customers and influencers). blueKiwi enterprise collaboration software solutions let groups connect, engage and interact with each other across geographic or organizational silo. 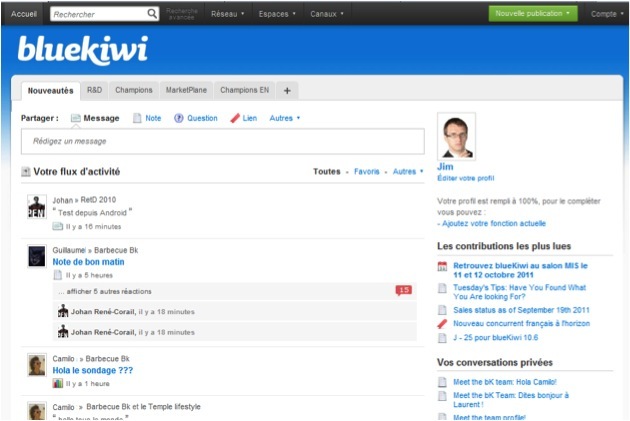 blueKiwi breaks down traditional communication barriers and is the best social networking software for promoting an open, connected environment where internal can communicate freely even with external communities (customers, suppliers, partners, influencers…). With a culture that fosters new idea generation and powerful business collaboration, blueKiwi enables organizations to achieve higher levels of business performance.